Organizations of all sizes face the challenge of managing massive volumes of increasingly valuable data. But storing this data can be costly, and extracting value from the data is becoming more difficult. IT organizations have limited resources but must stay responsive to dynamic environments and act quickly to consolidate, simplify, and optimize their IT infrastructures. 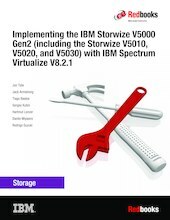 The IBM® Storwize® V5000 Gen2 system provides a smarter solution that is affordable, easy to use, and self-optimizing, which enables organizations to overcome these storage challenges. The Storwize V5000 Gen2 delivers efficient, entry-level configurations that are designed to meet the needs of small and midsize businesses. Designed to provide organizations with the ability to consolidate and share data at an affordable price, the Storwize V5000 Gen2 offers advanced software capabilities that are found in more expensive systems. This IBM Redbooks® publication is intended for pre-sales and post-sales technical support professionals and storage administrators. It applies to the Storwize V5030, V5020, and V5010, and to IBM Spectrum Virtualize™ V8.2.1. These pages are Web versions of IBM Redbooks- and Redpapers-in-progress. They are published here for those who need the information now and may contain spelling, layout and grammatical errors. This material has not been submitted to any formal IBM test and is published AS IS. It has not been the subject of rigorous review. Your feedback is welcomed to improve the usefulness of the material to others.